When Bob’s Red Mill asked me to create a fun new recipe using their organic unbleached flour, I started racking my brain… I’d been making a blondie recipe for years now – Chewy, buttery bars with perfectly crisp edges and those extra gooey pieces in the middle of the pan. My favorite way to eat them has always been warm out of the oven with a scoop of ice cream on top… Until now. I scandalously topped them with frosting… It’s commonplace to see brownies with frosting. But never blondies… Why? Let’s change that! But, this isn’t just any frosting… This is cream cheese frosting with a bit of cinnamon, nutmeg and vanilla thrown in. If there were a cross between a blondie and carrot cake – this would be it. 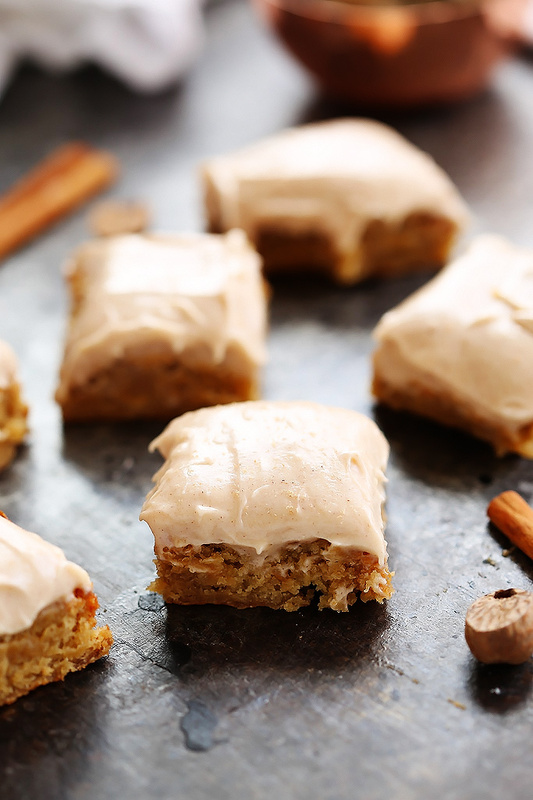 Perfect deliciousness… Chewy blondies with those decadent carrot cake spices and whipped cream cheese frosting. So, pretty much we’re taking all the “nutrition” out of carrot cake – I’m just borrowing the best part – The frosting! I solemnly vow to eat a handful of baby carrots as my penance snack for the day after indulging in these yummy treats. 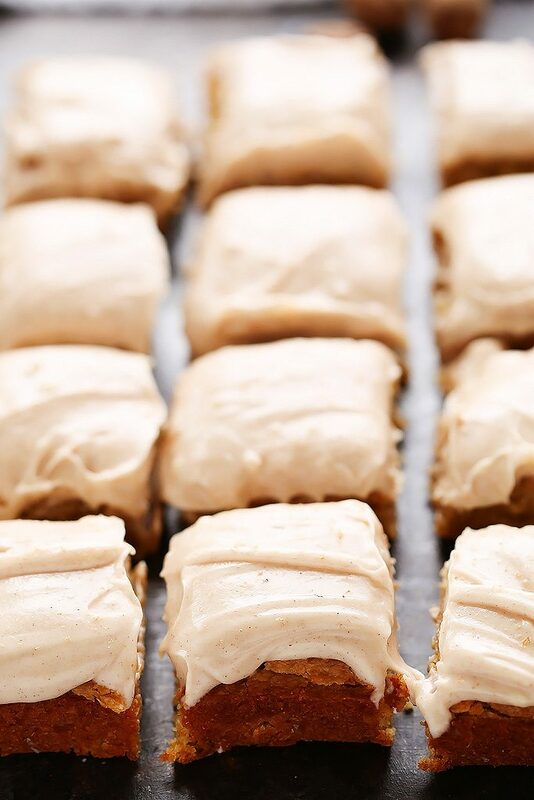 I will hereby eat 10 baby carrots for each of these blondies with cinnamon cream cheese frosting that I inhale. If you loved this Blondie recipe I would appreciate it so much if you would give this recipe a star review! Also, be sure to snap a picture of your finished dish and share it with me on Instagram using the hashtag #platingsandpairings and tagging me @platingsandpairings. I have admittedly not been a fan of blondies but I think that’s because I just haven’t had the right ones. These look DELICIOUS! Love the cinnamon cream cheese frosting! Thanks Marlynn – I hope I can help change your mind! Right?! Cream cheese frosting is my favorite! On a cold rainy day, drinking a cup of tea and eating a pumpkin bagel with this cinnamon cream cheese spread was a delicious start to my day! Thanks for making this. That sounds like a fantastic way to start the day Mary! I made them but my blondies were hard can u suggest me what went wrong please . I must admit the taste was good. You had me at cream cheese frosting! 🙂 I made these for a dinner party. They were easy to make and everyone loved them! I will definitely make them again. Thanks Erin! Cream cheese frosting is my favorite! Nothing else compares in my book 🙂 I’m glad you and your guests loved them Karin! Cookies look good. But the cinnamon cream cheese frosting is what blew my socks off. We will try these sometime this week. Thank you for sharing! This will make a great snack while hunting! Thanks. Hey Erin! I’m stopping by different blogs of fellow bloggers attending EFC in a couple weeks! I can’t believe it’s almost here! 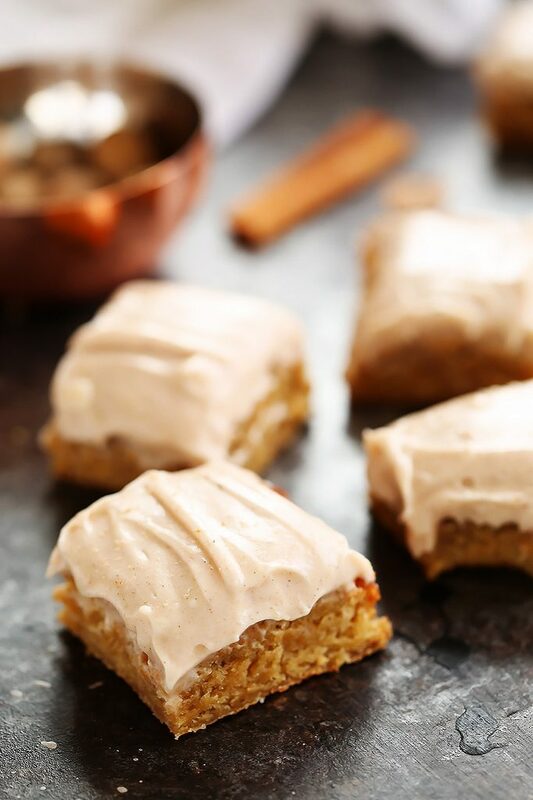 These blondies look amazing! You had me at cream cheese frosting. I def had to schedule this one to a few of my boards. Thanks Heather – I’m really looking forward to meeting you as well. See you soon! These look really good. Before I make them, I just want to make sure that it is 12 Tablespoons of unsalted butter for the blondies. Want to make sure I am reading it right. Thanks. Hi Sara. Yes, 12 tablespoons is correct for the blondies. I hope you love them. Let me know what you think! I made these today and they are delicious! The cream cheese frosting really adds a winter/fall flavor. Thanks so much Erin! So glad you liked them Danielle – I need to make these again soon!!!! Can you clarify that the butter for the blondes themselves should be melted? Recipe list says “softened” but recipe text says “melted”. I know it shouldn’t be melted for the frosting. Hi Tina – I just revised the instructions. You are right, it should read “softened butter” not “melted butter.” Thanks! I’m so happy to hear that Anna! Do you recommend making the frosting and refrigerating while the brownies bake/cool or should I make the frosting right before I frost them? I would make the frosting right before Julie – It’s easier to spread that way. Hi Terri – You should be able to find the flour in the natural foods section of your grocery store.